Mystery Beast Spotted in Grove! EXCLUSIVE!! 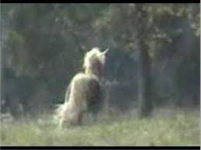 A mystery beast was seen at Rotary Field on April 1, a witness exclusively told the Orange Street News. Kristen Freed, 12, told the News she saw the animal, which looked like a horse with a horn, licking a silver pot. “I was just minding my own business eating a popsicle and there it was,” Freed told the News. Freed said it looked at her and then suddenly the mystery animal disappeared in the distance, but not before she was able to take this exclusive picture she shared with the News. This entry was posted on April 2, 2015 by Hilde Kate Lysiak and tagged april fools, Hilde kate lysiak, mystery beast, Orange Street News, rotary park, selinsgrove, unicorn, unicorn real.